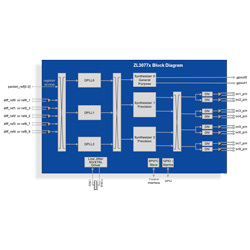 Microsemi Corporation offers its newest network synchronization IC product family for SyncE and IEEE 1588 timing and line card applications. Targeted for forthcoming 5G wireless equipment and network infrastructure, the new product family offers advanced phase measurement and adjustment capabilities, simplifying next-generation transport and wireless equipment design. These capabilities also allow equipment to deliver the stringent phase alignment demands which are down to 130ns across the entire network. As next-generation networks will move larger amounts of data giving increased connectivity and must do this with lower latency and at a lower price, the company’s new network synchronisation IC product family offers the feature set required to address these challenges. The devices’ precise timing capabilities to measure, monitor, tune and calibrate to the picosecond allow equipment manufacturers to address the tenfold increase in phase alignment accuracy needed by 5G networks.